What Is the Role of Natural Gas Compressor Stations? 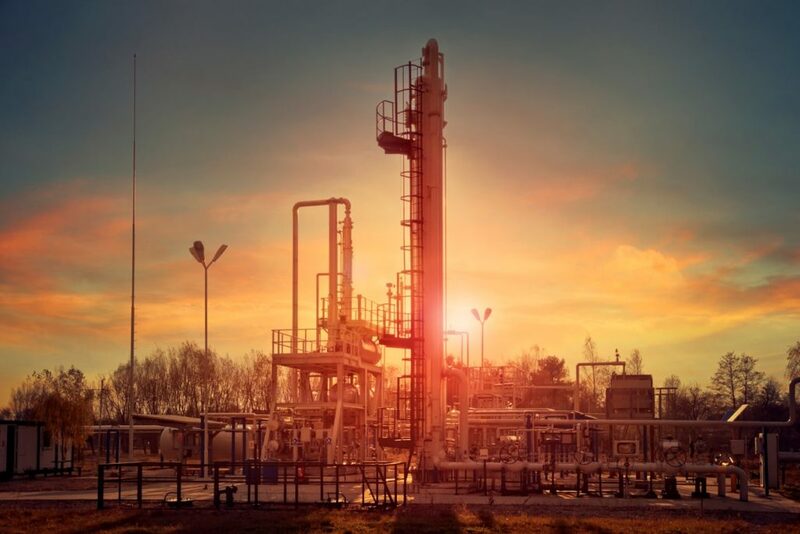 Gas compressor stations play a vital role in the United State’s system of transporting our natural gas to consumers from well sites where the gas is extracted. Here’s how. Since pressure and gas flow are essential to the procedure of moving gas, these gas compressor stations help to keep the process efficient and safe. Geographical elements such as elevation drops, mileage between well and end user, and the presence of friction between the gas and the pipeline infrastructure all play a part in retarding the speed and pressure at which the gas flows. This means that reciprocating compressor stations are hardly placed randomly. They are located with an eye to keeping the valuable resource of natural gas on the move. This is where natural gas deposits are rich and an essential part of the state’s economy. Since the gas pipeline reaches as far from these Southern and Midwestern wellheads to such states as Washington state, California, and Maine, it consists of approximately three million miles of pipeline. Much of it was first developed in the middle of the twentieth century, and it continues to expand at a rapid rate. This is due to new technology allows the extraction of natural gas from previously untapped areas. Expanding pipelines also means new gas compressor stations. When natural gas is extracted from a wellhead, a low-to-the-ground structure which sits on top of a natural gas well, it may have a long journey to its consumer. First, the gas travels through what is called a gathering system. These pipelines are smaller than those the gas will encounter later in its journey. In the gathering systems, the gas makes its way either to another, larger pipeline or directly to a processing plant for natural gas. At the processing plant, the unprocessed natural gas is separated from water, other gases, and hydrocarbon gas liquids. These help to ensure safe and more efficient transfer as the gas flows closer to its eventual destination in an end user’s kitchen range or industrial equipment. If the natural gas has a long way to travel from its wellhead to its consumers, it will enter into wider pipelines designed for long distance transfer. These pipelines apply high pressure to keep the gas moving along. The gas is on its way to further processing, facilities designed to store natural gas, or distribution nerve centers. If the gas has lost pressure on its journey from a particularly faraway destination, it will meet with a compressor or pumping station along the way—perhaps more than one. 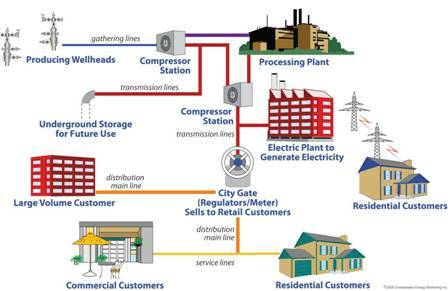 As the gas begins to near its end point, it is transferred to distribution companies. This provides the gas to specific geographic areas. Because the distance has closed between the end user and the wellhead, the gas lines used by the local distributors are once again of a smaller diameter. The gas is provided to the consumer at a safe, lower pressure through carefully monitored service lines. Gas compressor stations are usually fueled by the gas flow itself. When natural gas enters into a compressor station, it does through specifically designed yard piping. This piping protects the system from the gas which may have just arrived from faster-moving, high-pressure long distance transfer lines. Although some compressor stations are operated by an on-site staff, others are run solely via computer. Gas compressor stations are placed anywhere between 40 to 70 miles apart. First, the gas is driven through filters and specialized scrubbers. This eliminates particulates and other small solids that may have joined the gas stream as it traveled from the wellhead. A separator undertakes this task. Because this process is complex and involves a great number of safety considerations, the gas flow rate and pressure are regulated by computers. Gas is compressed by piston-driven, reciprocating engines. Sometimes, the gas requires a great deal of additional pressure; in this case, a series of compressor units take on the task. Since the compression of the gas throughout this process results in a great deal of heat buildup, cooling is necessary. This takes place in what is called “after” cooler. Liquids which result from the activities at the compressor station are collected, moved from the facilities, and recycled in such products as gasoline for cars. Sometimes, mercaptan is added at the compressor station. Mercaptan is the strong rotten-eggs odor mixed in to natural gas to provide consumers with an alert mechanism in the event of a gas leak. Most gas compressor stations occupy approximately five acres to accommodate their specialized equipment. They also provide something of a sound buffer for habitats and human neighbors. Easement agreements with landowners might involve negotiations with other community members regarding pipeline leases and easements. Since compressor stations must protect the public and any staff members, many safety features are in place; including the use of compressor valves. Every station possesses an emergency shutdown system in the event of leakage or unusual changes in pressure. This usually includes emergency shutdown valves, which are strategically placed throughout the compressor station’s pipelines, both incoming and outgoing. In addition, gas compressor stations, under law, must undergo tests of their emergency shutdown systems, as well as careful preventative maintenance. Fire and police personnel whose neighborhoods include a compressor station are recommended to undergo training so as to allow for effective operation of the emergency system if necessary. Gas compressor stations are governed by a number of federal and state statues, as well as several different agencies. These include the Clean Air Act, the EPA, local noise ordinances, and the Department of Transportation. Landowners and local communities are typically consulted when a compressor station is built so as to gather input and information about a potential station’s impact.